I bought a sticker machine this week. It’s small and it was very inexpensive and I can use it to make either stickers or magnets. Yessssss. One of the marketing ideas suggested to me was small trinkets or charms to hand out to people at conventions. I think taking a big stack of homemade stickers to ConCarolinas might be just the way to get people to remember me. I could really, really enjoy this. I’m considering just giving the stickers away, but at a fun “price”: make up a name, for instance, and get a sticker? Give me the one-sentence tagline to a novel that does not exist? 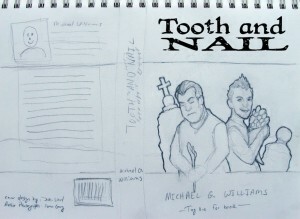 I’m also working with my cover artist over on Google+ to develop the cover for Tooth & Nail. The image in this post is the very rough first sketch he threw together just to kick off our discussion. I have to say, he absolutely slam-dunked it on Roderick’s face. I’ve given him some notes – including that Withrow should look angry rather than sad – and given him the blurb for the back cover since I’m planning to do a tee-tiny number of print books to take with me to ConCarolinas. Later this week I have another post discussing my next big decision: remain true to my principles or take the Kindle Select plunge?